High-tech carbon fibre rotor blades for the Silentwind and Air Series* wind generators. Silent Power Blades ( SPB ) were designed by a German engineer as ultra-silent replacement rotor blades for the Air-X wind generator and are now supplied as standard with the Silentwind marine wind generator. Precision engineering in carbon fibre and epoxy resin leading to a remarkably stiff and light weight blade with an amazing 70% reduction in noise. Wind tunnel tested - The design process used wind tunnel testing and an in-depth study of aerodynamics, aero-acoustics and aerodynamic boundary layer design to achieve the lowest possible noise combined with optimized aerodynamics. High priority was a low resistance re-design of the wingtip, one of the main sources of noise. Hand laminated Carbon fibre - By using high–tensile carbon fibre and epoxy-resin in and a hand laminated manufacturing process, the blades are extremely stiff and very light, 155 grams compared to the 190grams of the original blade, 20% lighter. The massive increase in stiffness results in only one third of the flexibility of the original blade almost completely eliminating flutter and the associated noise. The high tensile carbon fibre mat used in construction makes the blades almost indestructible, they been tested to DIN EN 61400-2 standards at hurricane speed 122km / h (5480 rpm, almost the speed of sound at the blade tips). Almost Silent - 70% less noise compared to the original Air-X-blades. This specially shows up in the frequency range between 1 and 12.5 kHz, that is most disturbing to human ears. When used with the Air-X the main source of noise is now the bearings inside the generator body, this is impossible to hear with the original blades. 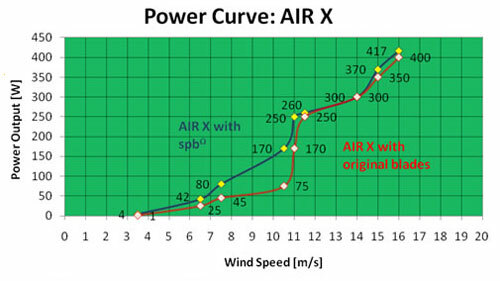 Increased Power - Wind tunnel testing has shown an increase in power output compared to the original blades of the Air-X especially in the wind range 7 to 11 m/s 4-5 Beaufort scale with as much as a 50% increase. The air breeze did not show significant improvements in power output but also but the noise level is significantly reduced. Silentwind parts although compatible with the Air Series wind generators are not approved by Primus Windpower.